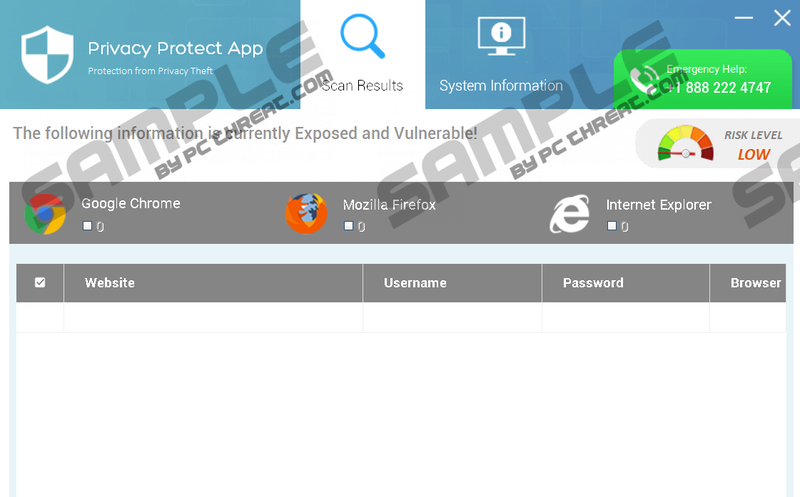 PCPrivacyProtect is a piece of software that is classified as a Trojan because it poses as a legitimate malware scanner, when, in reality, it is just another instrument schemers use to trick gullible users. Also identified as Trojan.FakeMS, this malicious program does not install itself onto the targeted system, which allows it to stay undetected. Of course, the bogus scanner using by this infection cannot appear out of thin air. According to our research team, the executable that belongs to this Trojan is most likely to be dropped onto the computer without its owner’s notice. Most likely, it is going to be downloaded along with other infections or potentially unwanted programs. Needless to say, that is a problem as well. If additional threats have invaded your operating system, you cannot ignore them. Sure, we focus on removing PCPrivacyProtect, but you must understand that there are plenty of other malicious threats that are just as or even more dangerous. To make sure that you do not overlook more serious threats, install a legitimate malware scanner and run a full system scan right away. Two different versions of PCPrivacyProtect might exist. One of them – just like the one we tested – could be operated solely via its .exe file, which means that the user would have to open the file to activate the bogus scanner. In another version, the infection might add a RUN registry key to make the executable run automatically, in which case, the scanner would pop up randomly. In either case, this tool should not be trusted because it cannot provide you with accurate or reliable information. The fictitious “PC Security Help” scanner can introduce you to “information” that is “Exposed and Vulnerable,” but that means nothing. Also, you could be introduced to a warning suggesting that your bank accounts, social media, and other sensitive accounts are at serious risk. To make things worse, PCPrivacyProtect also creates this warning: “These results may shock you. Please remain calm and contact your Certified Security Expert.” If you see a notification like that, the first thing you need to do is employ a legitimate malware scanner to analyze your PC and check if you need to remove any malicious infections. The purpose behind the malicious PCPrivacyProtect is to make you call +1888 222 4747. This number belongs to the cyber crooks who have created the malicious Trojan. Our research team has seen plenty of scams that use fictitious helpline numbers via which schemers can trick users into paying for bogus services, downloading malware, and opening up security backdoors. In most cases, these helpline numbers are introduced to users via fictitious pop-ups or malicious web pages. A few scams we can mention include “VOTRE ORDINATEUR A ÉTÉ BLOCKÉ, “Windows Firewall Blocked The Internet,” and “Call technical support +1 888-850-8578.” All of them use fake helplines to trick unsuspecting users into communicating with schemers. Needless to say, nothing good can come out of it. Whenever you are asked to call an unfamiliar number – regardless of how it is introduced to you – it is a good idea to check if it is legitimate. All you need to do is use a preferred search engine to cross-examine it. The instructions displayed below explain how to delete PCPrivacyProtect manually, but remember that this is not the only option, and our research team strongly recommends that you at least consider using anti-malware software. Why should you? There are several reasons for that. First of all, this software can automatically get rid of all existing infections, which means that if you install it, you will have PCPrivacyProtect removed automatically. This is particularly helpful if more than one threat is found because all of them will be erased simultaneously. Secondly, this software is primarily created to keep the operating system protected, and that is what you need if you do not want to face Trojans and other infections again. If you still choose to erase the infection manually, you can follow the instructions below. Just do not forget that malicious threats might remain active afterward. Make sure you employ a trustworthy malware scanner to inspect your PC for malicious leftovers. If they exist, delete them ASAP. Right-click and Delete the file named PCPRIVACYPROTECT.EXE. Launch Explorer by tapping keys Win+E. Enter %USERPROFILE%\Downloads into the bar at the top and then repeat step 2. Enter %TEMP% into the bar at the top and then repeat step 2. Empty Recycle Bin to get rid of the Trojan completely. Perform a full system scan using a reliable malware scanner. Quick & tested solution for PCPrivacyProtect removal.